Jedox OLAP Server is the key module of the Jedox BI Suite. It offers increased stability and performance, as well as new logical algorithms. It is a multi-user, high-performance data server application that allows workers throughout an enterprise to access, change and collaborate on BI data instantaneously. Furthermore, it offers a real-time aggregation through the multi-dimensional data model. Jedox ETL Server is a Web-based data acquisition tool that extracts, transforms and loads data into the Jedox database from transactional systems, data warehouses and other external sources. The application accepts data from relational database management systems, SAP, Web services and much more. This is the Excel-like interface through which users interact with Jedox OLAP, which gives the Jedox BI Suite its power. 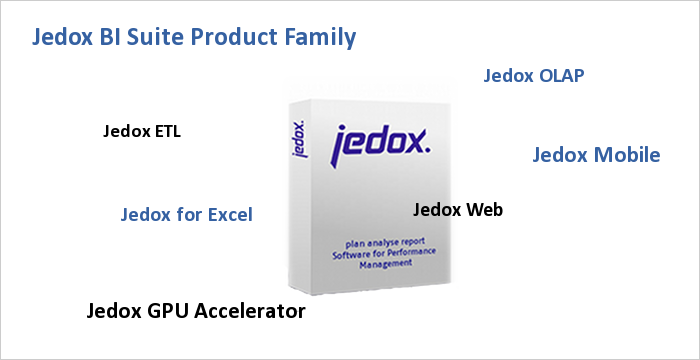 Jedox Web combines all Jedox components in a Web interface for users. Designers create Web-based reports, structure the OLAP Database or monitor ETL processes. Business users are able to view planning, analysis and reporting in Jedox Web. Jedox for Excel gives users direct access to data via Microsoft Excel. Existing Excel-based applications can easily be migrated into Jedox and leveraged further in the organization. Learning the Jedox Suite via Jedox for Excel is simple, and can be done without previous Jedox experience. With Jedox Mobile users get mobile access to planning, reporting and analytics on mobile devices such as the iPad the iPhone, or Android based mobile phones and tablets by HTC, Samsung or other manufacturers. In addition to the CPU of the server, Jedox GPU uses the tremendous computing capacity of Nvidia graphics cards (GPUs) to speed up large OLAP aggregations. Modern GPUs come with hundreds of so-called streaming processors and with several GB of graphics memory that allows Jedox to store cube data directly on the GPU. Courses to make your personnel technically independent. Scheduled public training is held at our NYC site. Jedox BI Suite was ranked No. 1 BI software by BARC and Dresner in 2011.